This production opened on November 12, 2016 and closed on November 13, 2016. It began in May 1941, when Bob Hope, with a group of performers, went to March Field, California, to do a radio show for airmen stationed there. It was to continue for nearly fifty years. Throughout World War II, with only two exceptions, all of Bob’s radio shows were performed and aired from military bases and installations throughout the United States and theaters of war in Europe and the South Pacific. His first trip into the combat area was in 1943 when he and his small USO troupe — Jerry Colona, Frances Langford, Tony Romano and Patty Thomas — visited US military facilities in England, Africa, Sicily, Ireland and the South Pacific. 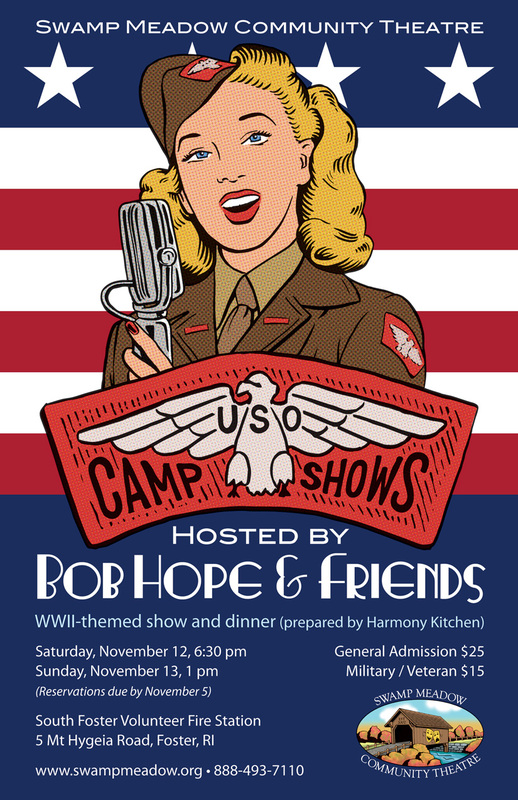 Hope brought his variety show to military camps and war zones to entertain troops with song, dance, comedy, and attractive women. For the little time the shows lasted, the entertainment brought home to the men and women in the armed forces. Come join us as we travel back in time to when our country was once again in fierce battle against the forces of evil to protect America’s freedom. Thank you for your interest in the USO Camp Show. Ticket sales have ended. Hope to see you there! Enjoy a delicious dinner featuring “Hubba Hubba!” Baked Ham, “Million Dollar Wound” Meatloaf, “Spud Duty” Potatoes, “Canteen” Carrots, “Pinup” Pasta, “Roger!” Rolls, and more. What’s for dessert? “All-Out” Apple Crisp with Ice Cream. Dinner prepared by Carol Mauro with Beth Hollis, Sandy Arnold, and Julia Arnold from Harmony Kitchen. Doors open at 6:00pm Saturday, November 12. Dinner starts at 6:30pm. Doors open at 12:30pm Sunday, November 13. Dinner starts at 1:00pm. General admission is $25. Military and veterans admission is $15. Reservations are required by November 5.